JONESBORO, Ark. -- Arkansas farmers have been hitting the fields hard, trying to plant before the next two storm systems, county extension agents with the University of Arkansas System Division of Agriculture said Thursday. “Craighead County farmers are going full bore, with some working through the showers this past Monday,” said Branon Thiesse, Craighead County extension staff chair said. In southeastern Arkansas, Desha County Extension Staff Chair Wes Kirkpatrick said that “ here fields are dry enough to plant, planters are running full throttle. 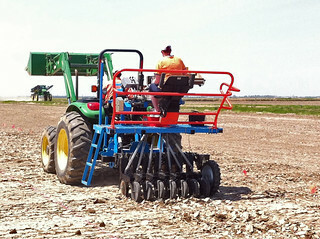 Planting has gone along in fits and starts this spring, as farmers tried to dodge winter’s long grasp and spring’s frequent showers. Stiles said he hasn't yet seen any panic on rice acres. Technology has been a boon to farmers dealing with wet weather. “Our fields and equipment are developed to the point today that extraordinarily rapid planting progress can be made within a week of good planting days,” he said. The National Weather Service was expecting two rounds of storms on Thursday, with severe storms expected with damaging winds. Forecasters were not ruling out an isolated tornado. More severe weather is expected for Sunday afternoon and evening with damaging winds and large hail possible. Rainfall with Sunday’s storms could range from a half-inch to 1 inch in the western part of the state and range from 2-4 inches in the eastern part, the National Weather Service said. Cotton was 1 percent planted, with zero planted the previous week. Soybeans were 7 percent planted, up from 4 percent the prior week. For more information about crop production, visit our newly revamped site at www.uaex.edu, or contact your county extension office.